President of India Ramnath Kovind today said that in a democracy, Information overload wa always preferable to information deficit. 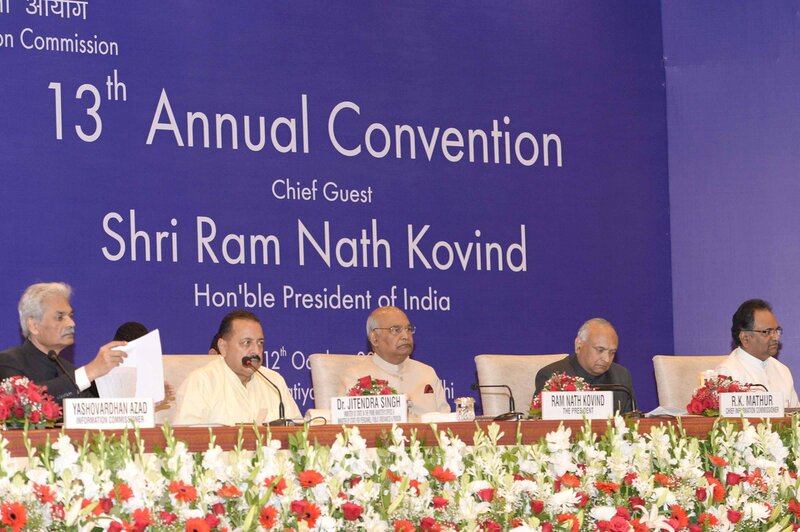 Addressing the 13th annual convention of Central Information Commission here, the President said, people have a right to know how they are being governed, how public money is being spent and how public and national resources are being deployed. He said it is people’s right to know how public services are being delivered, and how public works and welfare programmes are being carried out. Mr. Kovind said, Right to Information is about nurturing the social contract of trust between the citizen and the state where both must have faith in each other. “We must be cautious against fringe cases that try to use the RTI mechanism to settle personal scores. Especially in an age when privacy has become a matter of such intense debate, it is crucial to maintain this balance,” President said adding that “there is also need to look at our declassification protocols for government and archival documents and see how we can modernise these”. The President said, a related and parallel implication is to ensure rational use of public resources to check instances of corruption or waste. He said, the Internet and the digital economy have been used to advance e-auctions of mining blocks. They have helped create the Government e-Market or GeM portal for public procurement of goods and services. There are half a million public information officers under the RTI Act. The estimate of requests for information is as high as six million requests a year.